Laundry can be a tedious chore for anyone managing a household, but it is an even bigger job for those who must wash other people’s dirty clothes, sheets and towels in a commercial atmosphere. That’s because the majority of the stains of are unknown origin, the amount of items for the washing machine is as high as a mountain and the folding process can be extremely time-consuming. 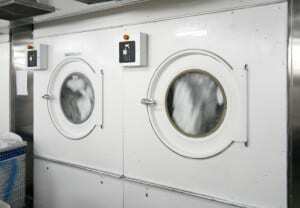 Laundry duties are commonplace in businesses such as hotels, hospitals, restaurants, schools and more. Some, like hotels, may need to do laundry daily to keep linen closets properly stocked and guests comfortable. Others, like schools and store retailers, may need to throw in the wash less frequently as they are primarily laundering cleaning cloths, mop heads and kitchen towels. By properly training employees, staying on top of costs and using the proper amount of product, business owners can easily conquer the “Mount Washmore” dilemma. Make safety a top priority. Some stains are generated by body fluids, biological materials and potentially harmful chemicals, so it is important employees take the necessary steps to protect themselves. In fact, studies prove that workplace laundry duties are far more dangerous than previously thought. Protect employees from harm and the business from lawsuits by recognizing the risks associated with commercial laundering and teaching employees how to avoid potential problems. For example, provide employees with protective equipment, such as disposable gloves, so they don’t have to touch dirty laundry directly. Schedule routine machine maintenance checks. Make sure doors shut properly and latches secure tightly. Check drain hoses, lint filters and electrical connections to ensure none of the machines is leaking water or gas. In addition, keep the number for the local Poison Control Center posted near the machines and laundering products in case of an accident. Train, train, train. Commercial laundry machines, dryers, dry-cleaning equipment and steam cleaners often operate much differently than household versions. Always follow the manufacturer’s directions for use and keep these instructions posted in a prominent place to employees can refer to them as necessary. Also, keep laundry products such as detergent, fabric softener and bleach in their original containers so employees become familiar with the recommended amount of product to use and how to use it. Keep all containers tightly sealed when not in use to prevent spills. – Lowering temperature settings. Not every washable item needs to be laundered in hot water. Try different temperature settings, but don’t sacrifice safety. For hospitals and hotels, many items will need to be washed in hot water. Keep in mind the type of laundry the business handles and consider purchasing a detergent formulated specifically for cold water use if applicable. – Washing a full load. Keeping the laundry machine filled to capacity saves water, energy and time. – Removing clothes from the dryer when they are dry – not when the dryer buzzer goes off. Items are often over-dried. Another dryer tip: Wash loads back-to-back to take full advantage of the heat left over in the dryer from the previous load. Use the best products for the job. Always purchase quality laundry products that will take care of the dirt, grime and stains the first time. Nothing wastes time, energy and money more than having to re-launder items. Commercial laundry products typically cost far less than the branded ones seen on supermarket shelves, so find a dependable janitorial supply company. Also, teach employees how to spot stains that need to be specially treated. This way they are taken care of promptly, ensuring the best defense for removal. Snee Chemical Company makes a powdered Oxygen Dry Bleach that is appropriate for all fabrics. It is even safe for whites and colors as well because it contains no chlorine. The company also manufactures Oxy Care, a phosphate-free product that removes organic stains and odors when activated by water. These Snee Chemical Company products, as well as many other laundry products like Low Suds Concentrate, Laundersol and HTD Heavy Duty Detergent are available at WorldwideJanitor.com. This entry was posted in Laundry and tagged bleach, commercial laundry, Fabric Softener, HTD, HTD Heavy Duty Detergent, laundersol, laundry, Lemon Scent, low suds. Bookmark the permalink. Thank you for the post. These are great things to consider. I totally agree that safety should always be a top priority. I think training is the best way to keep things safe. The more the employee knows about the equipment the safer they will be.